Anika was a garden today with the patterns and colors of spring. 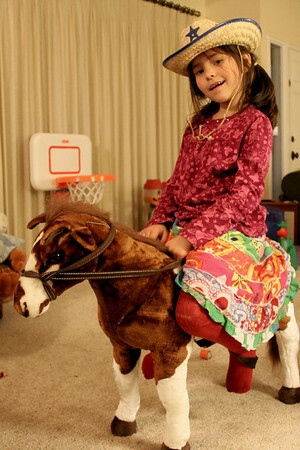 Then she rode down the hall on Biscuit, her horse. 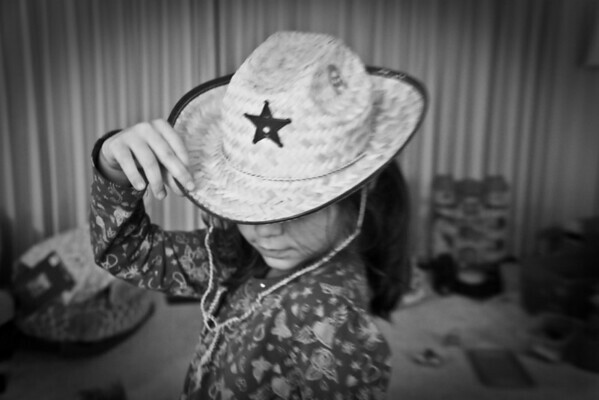 Moments later, she came running out with her cowgirl hat. For some reason, she really wanted to pose for pictures, so I got quite a few moments of her cowgirl-self with her best horse, Biscuit. No, not Biscuit. Dumpling. I have to get the Dumpling story tomorrow because it had a good reason for being Dumpling. And I had forgotten until she said here's my favorite Dumpling. She remembers everything. And Ian sat on the horse and climbed the couch and the table. He moved so fast, all of his pictures came out blurred. Except for one tiny moment with a book. And even the book is blurred as he turns the pages.